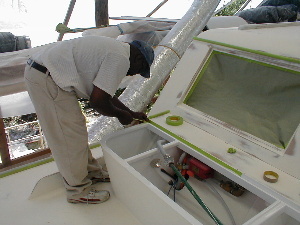 May 28, 2003 Like the slow unwrapping of a gift, each day at the site is full of surprise and delight as the beauty that is Cherokee starts revealing herself. 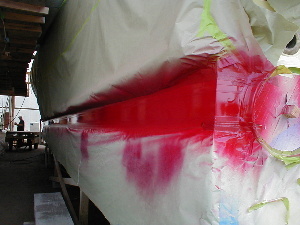 Despite the incessant rain, the paint crew has finished the red boot stripe, depicted below. 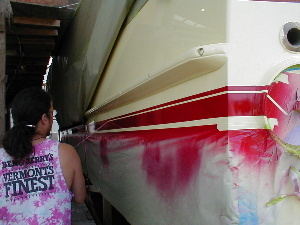 See Bryan removing the tape and paper to reveal the nice combination of red, Fighting Lady Yellow, and the varnished transom! Is that a mermaid below at Weeki Wachi Springs reaching for her air tube? 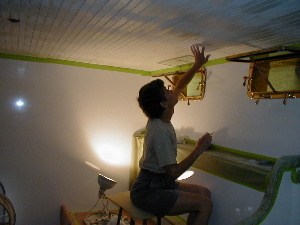 No, it’s Jeanette, finishing up the ceiling in the master stateroom. 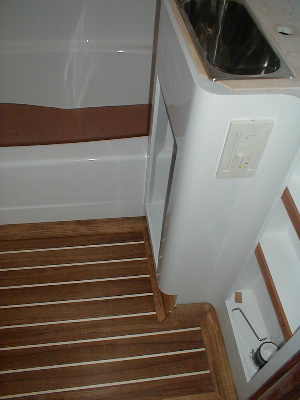 The master head floor has been fitted as well, depicted below right. 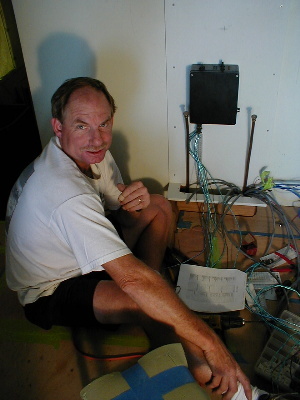 Steve Gilpin, the most sought-after boat electrician in Carteret County, is experiencing the joy of joy-stick installation with the steering system. After running nearly twenty-seven million miles of wire in the Cherokee (I think that’s what he said) and making the last one hundred and eighty connections to the joy stick’s black box (brain), the system is almost ready to be tested. This control system is provided to Rolls Royce by Vector controls. That crazy paint crew just won’t quit! 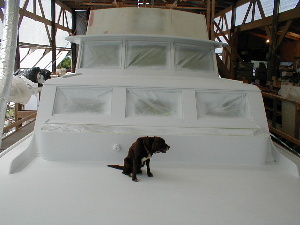 The boot stripe was barely dry before they commenced to sand and prime the topside, turning the bow area into a big white wedding cake with a dog on top. 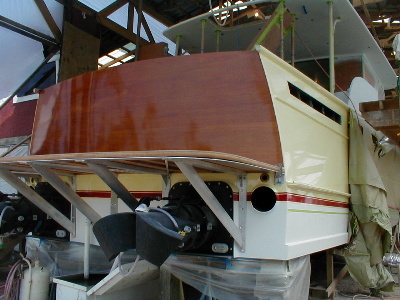 Within the next couple of days they will apply the white topcoat to the cabin sides. All the book shelves and port lights are in. 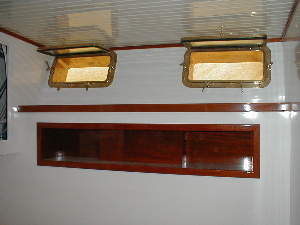 Below is the book shelf in the guest room, smiling with a big wooden mouth and gleaming port light eyes.